Kindly Test Out The "#ulog-surpassinggoogle Editor" On Ulogs.org, Another Fun Editor To Post To Steem. Note that ulogs.org will have an entire core segment dedicated to FanLove. Overall, we want to build an ecosystem were deeply-rooted love can exist. Yes, an ecosystem of "true fans" and thus, "true celebrities". Well, we will discuss all these things in a separate post. If You Can't Find A Stranger To Love; Love Me & Entertain Freedom When You Do! If I Say I Love Steemit Like Crazy, There Is No Ounce Of Exaggeration Involved. The plain truth, in my case is, when it comes to "loving me"; only "loving me my crazy" works! I am grateful to everyone who has loved me all along and to those who have chosen to love me like crazy but there is more, if you are deciding to take it up now and want to "love me like crazy", you now can and you now can be timeless about it. Make use of https://ulogs.org/ulog-surpassinggoogle to love me like crazy. The #ulog-surpassinggoogle editor breaks me down. It leaves you with my very cookies in its bareness and by means of my cookies, i am very reachable as my soft-spots are in these very cookies. He dedicates his entire steem journey to his mum. Boys do that. He loves humans like crazy, deeply-rootedly, unshakenly. He understands and has done suffering like crazy but loves like crazy still. His substance is deeply-rooted. He will forgive a hundred times. He will sift even the not-so-good to find good in it. He is un(dis)talented, a legit illiterate and possesses rare INTEL. He wants to build every noble dream. He is always on the more testimonial harder route. He will dig, dig, dig, especially if being "this diggist" involves "YOU". To prayers, "his amen is on default". He is ever-unshakenLY "your boy terry". You can also use the #ulog-surpassinggoogle when you want to dig-dig-dig and go diggist into uncovering the endless-rest of my cookies. Well, that is how "loving me like crazy" works. To become like me, you will have to stubbornly become the awesomest version of "YOU". I am very reachable in my cookies and i am all out there. So, when i am a mute flute and you aren't able to reach me in audio, you can in my cookies. Explore #ulog-surpassinggoogle. Be "true fan" on there too and well, not only will you find me, you will find "YOU". Please join in, subscribe to this sub-reddit and kindly share daily ULOGs and #ulog-based posts (ulogs.org URLs, steemit.com URLs etc) on to our sub-reddit daily. Now we know why you are "muted" lately, especially during the talm show. But in reality, you arr doing something worthwhile. Thanks for this post. I shall try this first thing tomorrow when I log in. Almost about to hit the bed. I am so gonna try out this editor. I actually took a close look at it some days back and loved what I saw. It's almost like busy dot org and even better. I was so impressed. I will be making use of it for my next ulog. There was a day you spoke about video ulogs but I noticed that I never get upvoted when I post a video ulog and I have been wondering what might be the problem. Are video ulogs invalid now? The world is waiting on this beautiful baby called SMT, she will be so adopted that many other blockchains will be left out. Terry has not been available in recent times, but I am always consoled with the thought that he is working behind the scene, nonstop. The community really appreciate this update, as short as it is, it goes a long way. Great development. I really need to try the editor. Si mund të jem pjesë e ekipit tuaj? How can I be part of your team? Will definitely try it out, sir. You cannot be mute, of course, when you have a whole flock of people to care for. We look up to you on daily basis for inspiration and doggedness to continue to persevere in what we do here including spreading the good news of steemit. I like how you brought to the fore on the progress being made to see that SMT sees the light of the day very soon. This will clear the fears of doubting Thomas that it may never materialise after all. Thanks for calming frayed nerves by this update. Yeah, it is what we need at this point in time. Updates. There is time to wait to make this happen . Am quickly going for this and make it happen asap. Apart from the fact @surpassinggoogle ask for this , it is another opportunity to contribute to the growth of the community. Let me quickly go and do my part in building the nation . I made steemgigs show post using the new #ulogs editor, it has #ulog-surpassinggoogle as the second tag. I love the fact that there's something to learn from once we open the editor. You love the you in me like crazy, so I also love you like crazy diggist. And though while mute you still function with the highest proportion, but we miss you and our prayers are with you. Do derive strength from our strength, hope we get to hear your voice during the next voice channel. Seriously, ive never heard this before and this will surely be my motto for this month, being the awesome me, doing the greatest me, thanks for this word @sirterry. The steemit minnows owes you a lot of thanks. It's good t know you are all right. To be frank most of us, have been worried about your absence. I just pray you get pretty quick.. Much love. Thank you for explaining for being mute this past few days or weeks . But behind the scene, you are working for something which I know it can benifit us all. Nice seeing you back @surpassinggoogle. I think you are a generous person, I am from Venezuela and your support has helped me a lot by using Ulog.org and Using the Ulog tag! the idea of ​​writing Ulog is also very funny and original. I knew you're very busy these days and I am happy to feel your presence in the Sunday show despite not hearing your voice. By the way, I noticed that ulogs.org is getting better. More power to you Sir Terry. Terry With new tag, you will live in heart of steemians and uloggers . 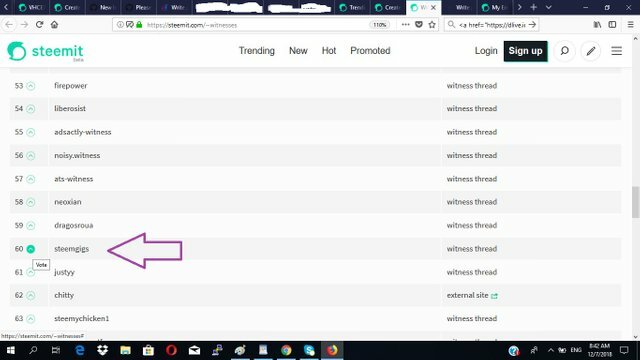 Currently I am not using ulog.org , am using ulog tag on steemit . Wow gonna try this one., It's been 3 weeks I haven't posted anything here in steemit. Becoming mute does not mean becoming inactive.i hope you do find the strength that you need to accomplish all your dreams. But for sure, lots of ULOGGERS will be loving you just the same and be your fans. Awwwwwwe, I am sure you know we love you too!!!! Im very thankful to Steemit that it found you @surpassinggoogle, then you found us and brought us #ulog and ulogs.org. we really struggles on creating good content but sometimes i felt empty, good thing that we have ulog now, as well #untalented, #teardrops. Thanks a million to you bro Terry 😁. Surely I will check this sub-reddit, then follow the instruction on your post. sir i already check and test ulog editor maybe it's ok.
hello I am your new friend.I shall follow you continue. I will try it sir. Dear @surpassinggoogle,who is he with you? I'm so thankful sir because of your generosity and giving a chance to all people here in this community, by your ulogs teardrops, steem untalented and many more. You gave us hope and happiness. Thank you for being our boy Terry. You’re such a humble guy. I'm hoping all the success to your projects sir! Definetly try it dear @surpassinggoogle. It gives me lot of good response by steemit community. And good response by @surpassinggoigle also great. Try it sir. And thanks for providing a wonderful plateform to steemit community. Ulog is very great for the community where every can feel free to saysomething. If you really love other people, they will love you back. Love is the solution of all problems. Love is something that puts smile on our face and makes us happy. Thank you @surpassinggoogle for spreading the love. Looking forward to trying the new editor out @surpassinggoogle. sir @surpassinggoogle is the best witness i ever had.,hope you never stop making the good articles especially supporting us. and to your newly launching ulog.org editors you are so great and have a god gift. maybe god send you to us to make our supportive witness. we love you so much we will support you whatever it takes, what ever your projects you can count me in i am your biggest fun your ever lost. Loven it the motivational words @surpassinggoogle. There is no wrong if people liking you like crazy. I try it soon Sir @surpassingoogle i select steemgigs for vote for witness. This will be another huge success for the #ulog!!! You never fail to innovate or create something new. We are truly grateful for all the things you do for us..
Btw, you are allowed for little breaks. Take them! Dont overwork yourself Sir @surpassinggoogle! Terry, although he is silenced, we know that you are always here in Steemit, supporting this great community. I'm waiting for your new publication, thank you! I used ulogs.org for commenting sometimes. I am also waiting for teardrops token to get live. Sounds great I haven't try it out but I'm gonna give it a try because I trust in your recommendations.